After a good spell of gray and wet weather, we had three beautiful, clear and cold days. 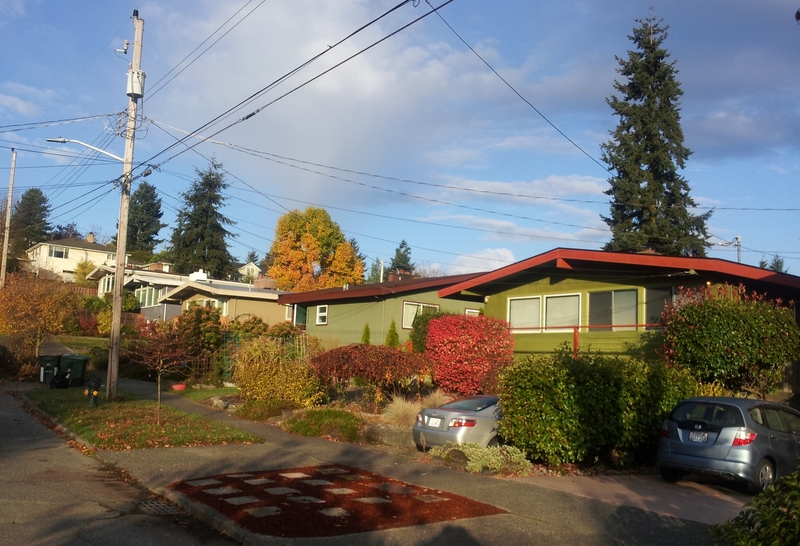 While I was on my morning walks, I took some pictures of my neighborhood with my phone. This is a partial view of my block. The hug fir tree in the upper right corner of the picture marks the back of my back yard. My house is the green house with wine colored trim. This is my house and front yard. 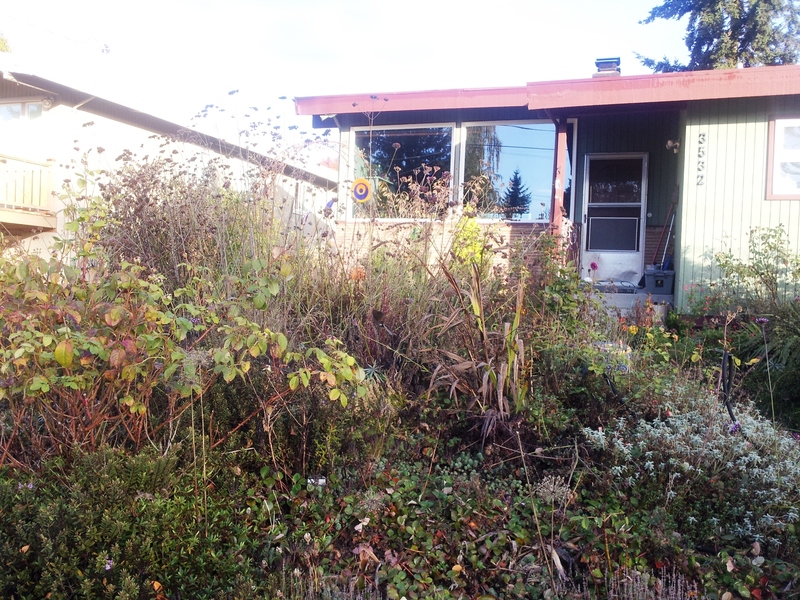 The front yard is actually a rock garden in the foreground, sloping up to the front yard. As you can see, I have not gotten to my fall clean up tasks. I’m going to try to get to it in the next couple of weeks. Otherwise, fall clean up turns into spring clean up and I will probably not be able to garden in the spring due to my March surgery. This is a super fancy house for our neighborhood. I covet their decks and the mountain and water views they must get up there. I did notice, that they have almost no yard. 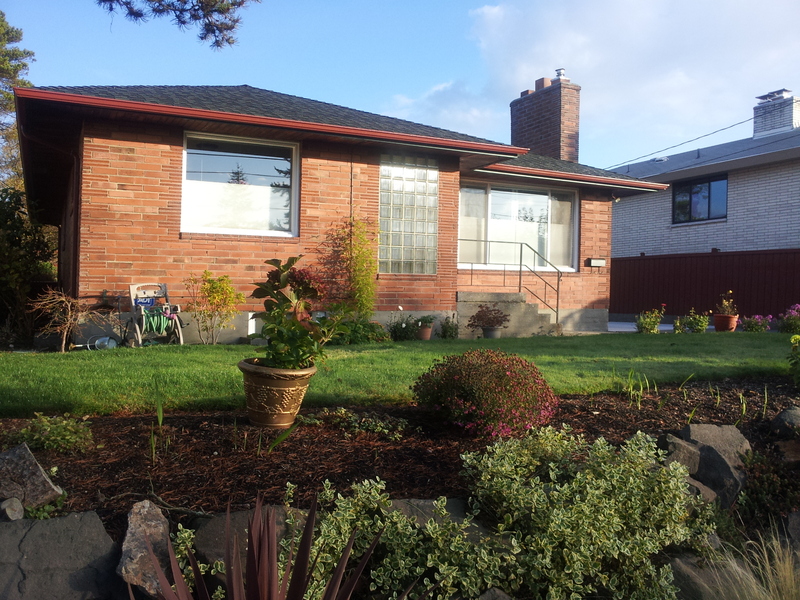 So this makes me happy with my 1950’s Donna Reed house with more room for gardening. These apples looked so pretty in person. I was tempted to pick one of them. 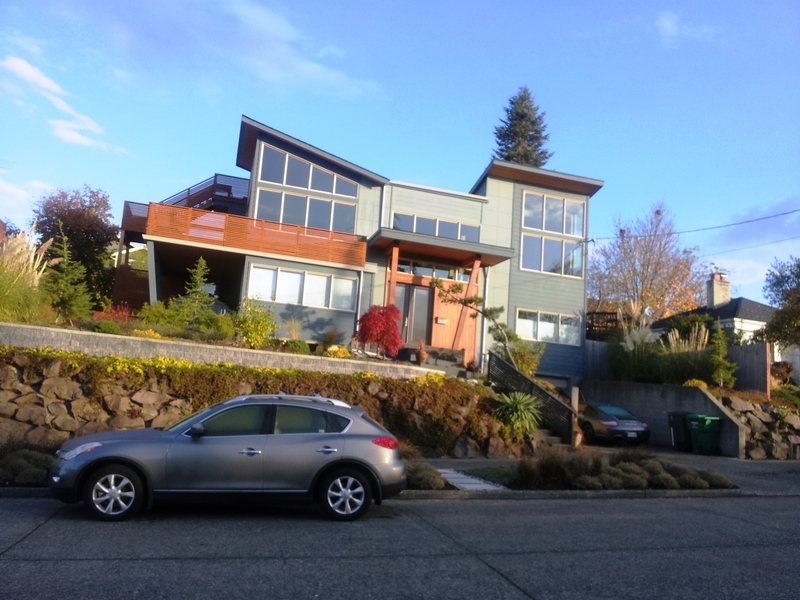 Unlike “super fancy” house, this house is more typical of the architecture in our neighborhood. This house does get a neat and tidy award, though. My phone camera is really limited in taking pictures of distant objects. 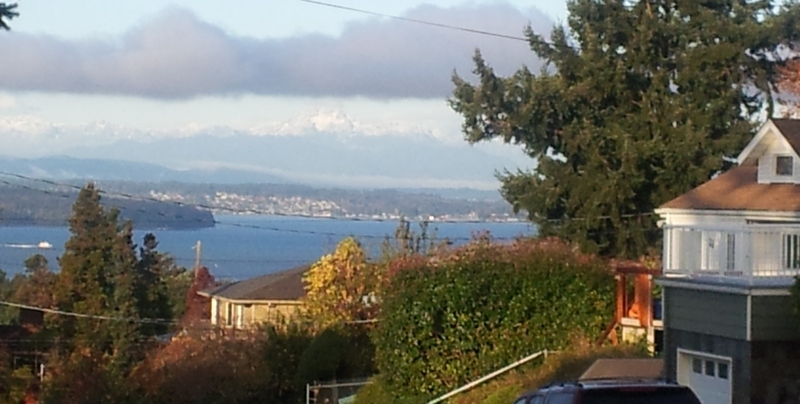 This is a view from my walk of the Puget Sound, a couple of islands, and the Olympic Mountain range. I could see that the mountains had fresh snow. 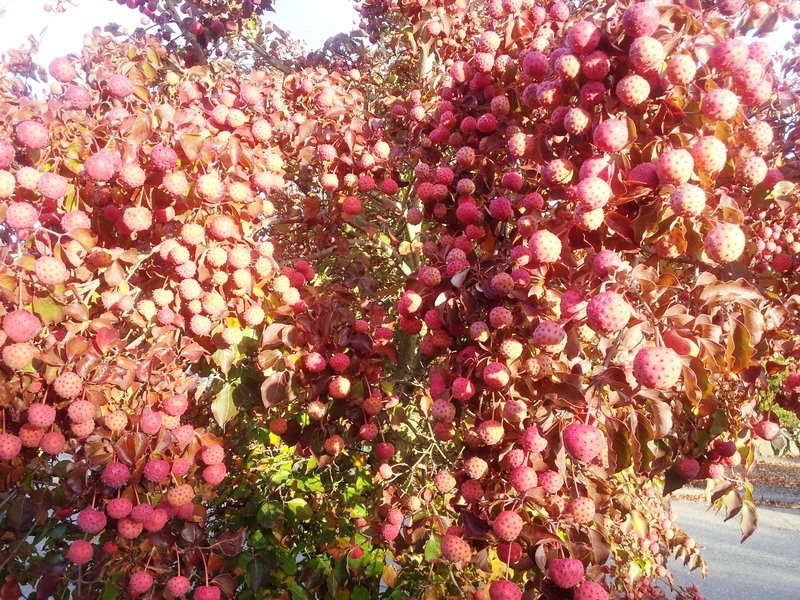 This is a close up of one of the neighbor’s heavily fruit laden dogwood trees. The fruits are edible but bland. I imagine the birds are less picky about them, though. I know phone cameras aren’t great but your neighbourhood is beautiful, thanks for sharing it. And if it’s any consolation, my garden is in a similar state – I haven’t been able to do a Fall tidy up so it’s going to be a big…. Summer clean! Thanks, Tracy! Like you, I live in a beautiful part of the world surrounded by water from the sea and the clouds. I was happy to enjoy some glorious sunny days before the clouds came back today. And yes, our gardens will get tending again in the future. It’s hard to do cancer treatment and gardening at the same time. I am always impressed with the trees and plants on city property. What a great view. I think I’ll try that walk. Your yard always looks so lovely. Hi Mom, we can go on that walk some time soon. And yes, people are serious about their gardens around here! I wonder if that was my dogwood tree in your photo. 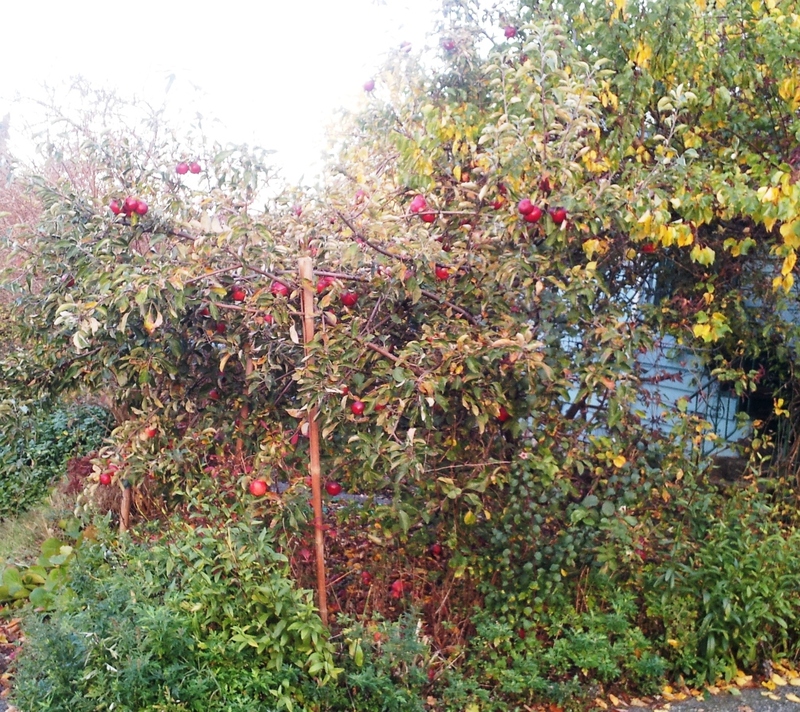 I wish the birds would eat the fruits. In my experience they just fall on the ground and make a mess. They are pretty while they are still on the tree, though. Hi Deana! I miss seeing you out in your yard now that the weather’s turned cool and wet. Your trees were looking lovely that day but I was across the street taking pictures and the one here is Tara’s. Thanks for the neighborhood tour! I go past a tree like the dogwood on my way to work, and wondered what those funny fruits were. I know a dogwood when I see it in flower, but I guess I don’t know one when it is in fruit. Somehow, I forgot what that tree looked like in the spring before it got all those little pupwoods on it. This particular tree is a Kousa Dogwood, compliments of the City of Seattle’s Street Tree Program! We got street trees, too during that neighborhood planting. Ours are Japanese Snow Drop. They aren’t as pretty but they are way less messy.